Changing the spark plugs on a 2000 Ford F150 with a 5.4L engine is a challenging job, particularly on the driver’s side of the engine. This post will cover some dis-assembly and other aids to performing this maintenance task. Also discussed at the end is a stubbornly stuck boot that was encountered during the job. Tools: 7mm 1/4" drive socket, 5/8" spark plug wrench, 7 mm wrench, extension bars, ratchets, gapping tool, small vacuum cleaner and vinly tubing, optional: a claw-type grabber tool, vice grip pliers and peg hook, a 40" long board. 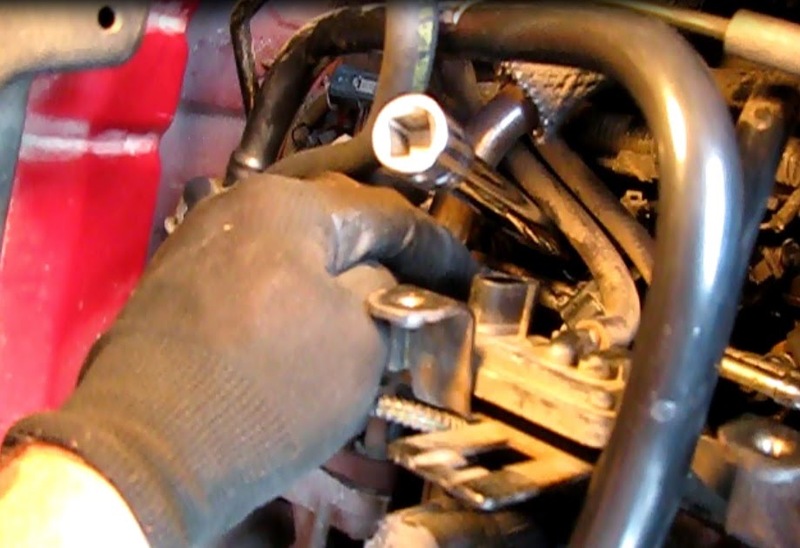 1) Unplug the fuel injector near the plug being replaced. The connector is in the way of the coil hold down bolt. 2) Unplug the coil pack. This will allow for the twisting sometimes needed to break the boot free of the plug. 3) Unscrew the coil bolt with a 7mm ¼” drive socket. I used a deep well. 4) Vacuum out the plug well. 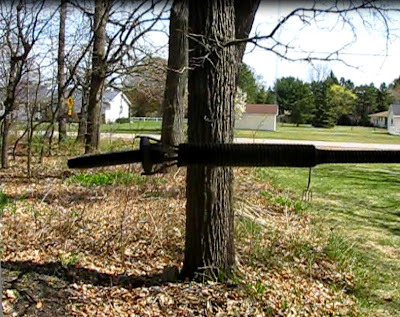 I consider this a necessary practice to prevent debris from falling into the head. It may be better to attach a piece of close-fitting vinyl tubing to your hand vac. 5) Remove the plug with a 5/8” spark plug socket. 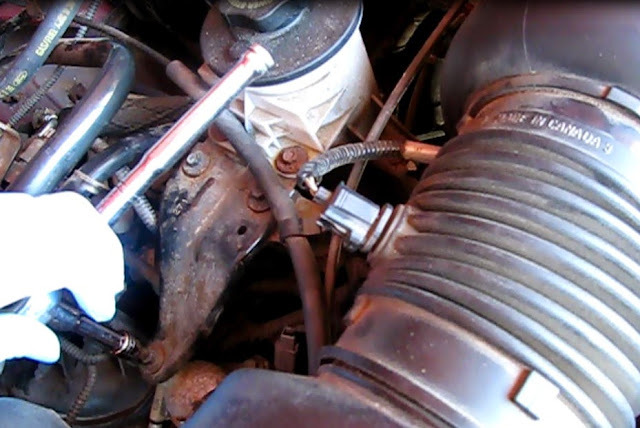 I used a 3/8” spark plug socket, a 3/8 to ½” socket adaptor, a 6” long ½” extension bar and a ½” ratchet. Always make very small turns at first on these plugs to avoid over-stressing them. Breaking off a plug could turn a challenging job into a disaster. 6) Gap the new plug to .052-.056”. 7) Put some oil or anti-sieze compound on the threads and hand start the treads. It is also a good practice to coat the inside of the boot and the ceramic part of the plug with dielectric grease. Finish with a ratchet and torque to 20-25 ft lbs. 1) It is easier on this back plug to position yourself on top of the engine to better reach it. I placed a four foot long by 20 inch wide board across the battery and the plastic molding above the radiator. Then while on my stomach I was able to better reach the coil and plug. Assume the position to get this job done! 2) Unplug the PCV valve from the valve cover and move off to the side. 3) Unplug the fuel injector. Due to extremely close quarters, I could not unplug the coil pack without some help. I used a vice grip with a peg hook clamped on it. I then depressed the connector release on the back with the peg hook, while pulling up on the connector with my other hand. 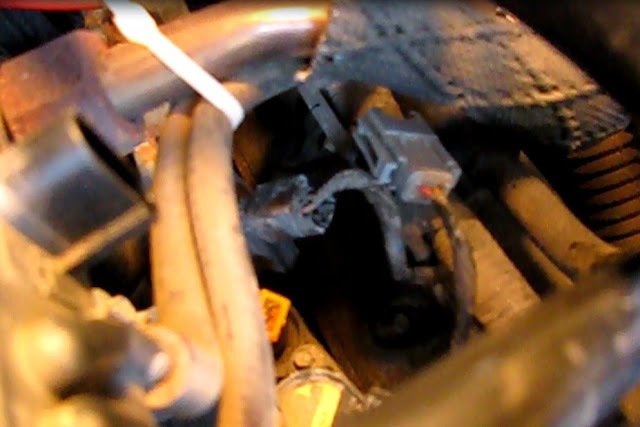 4) Remove the spark plug with a six inch long extension bar and half inch socket. The rest of the procedure is no different from the earlier coils and plugs. The challenge on this side is due to poor access blocked by the power steering reservoir and bracket as well as a large wire harness and many vacuum, gas and exhaust lines. I will discuss each plug in turn from front to back. 1) Remove the throttle body cover (one 8mm and two 10mm bolts) to provide better access. 2) Unbolt the triangular power steering bracket (three 8mm bolts) and swing it off to the side. The front- most coil is now perfectly visible and reachable with a 7mm deep well socket and ¼” ratchet. Fifteen inches worth of extensions are needed to get the ratchet above the air intake ducting. 1) Unplug a two wire connector above the plug and move it to the side. 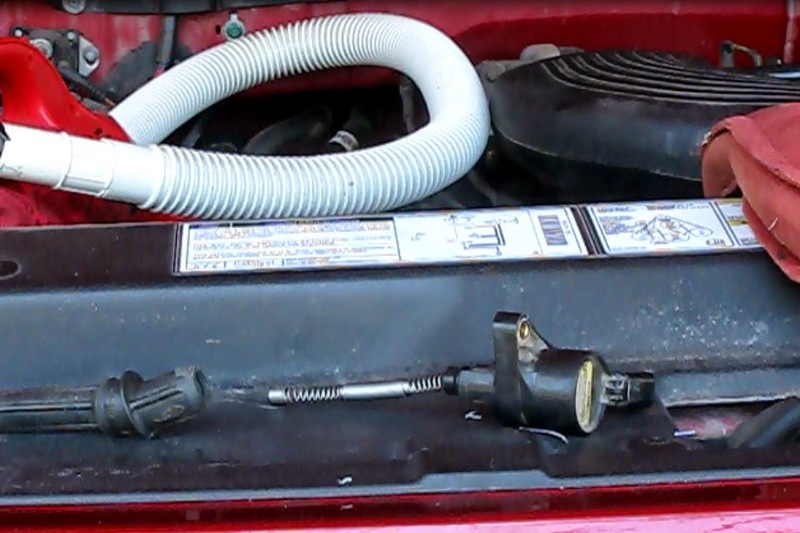 2) Move two rubber hoses away from the plug and hold them there with a zip tie or other means. This coil is now accessible. It gets more interesting. This one has the least access of all, owing to a device on the gas line, just above the coil bolt. 1) The wires on the back coil are also in the way, so unplug them and move them aside. 2) Optional: remove back coil first. This makes for a better turning radius for the 7mm wrench needed to turn off the 2nd from back. 3) It may be helpful to separate the lower wiring harness from its wire tray. 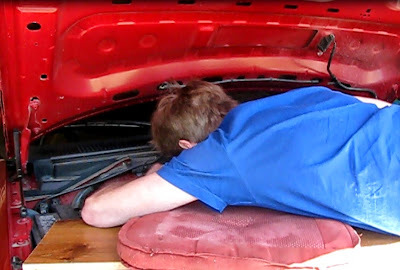 This allows more room to get a wrench under the harness and turn out the coil bolt. Cut the electrical tape binding it to the wire tray. 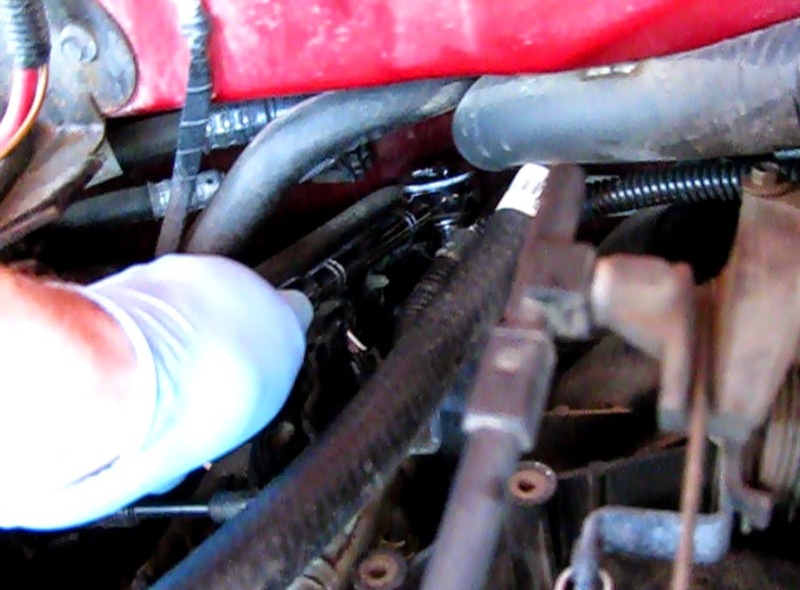 4) Remove the plug with the 15” extension between the exhaust re-circulation pipe and the two rubber hoses. 5) A clawed grabber tool will be a big help in getting the coil bolt back into place. 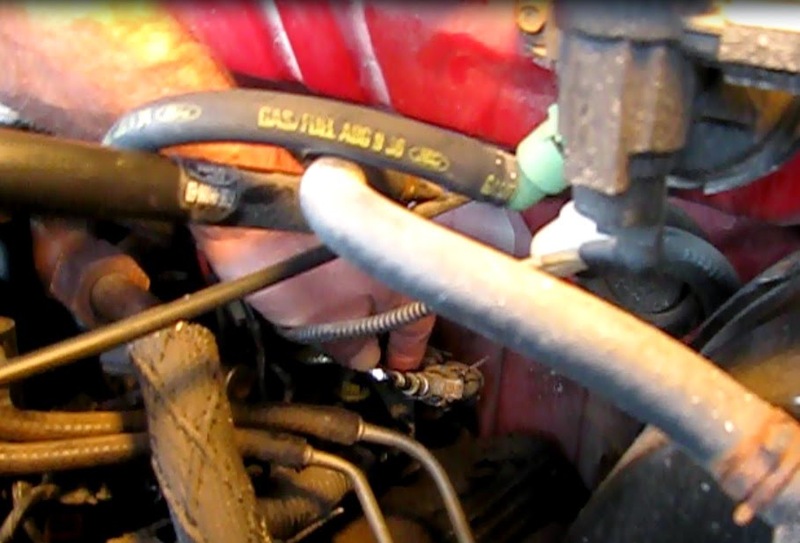 The coil bolt is not impeded by the fuel injector wiring on this one. But there is not enough overhead room to get a socket on it. 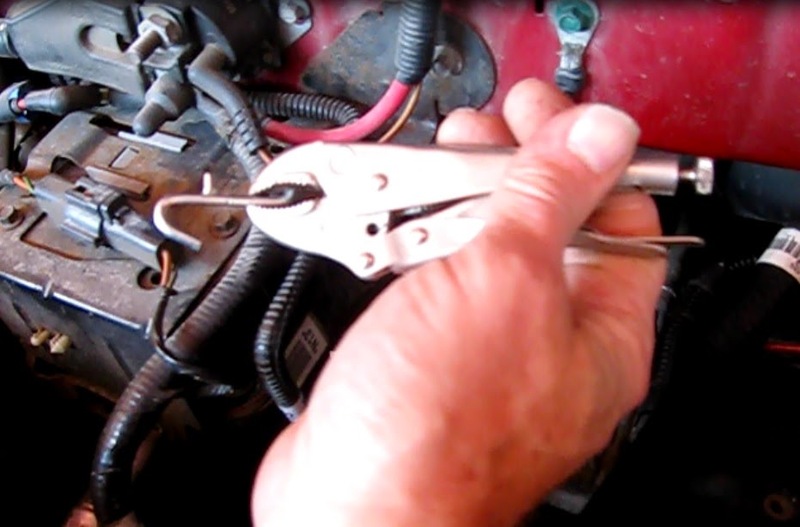 1) Use the 7mm box-end wrench while reaching over the engine. After loosening it bit, turn it off with your left hand. 2) Remove the coil through the maze of tubing, lines and wiring. 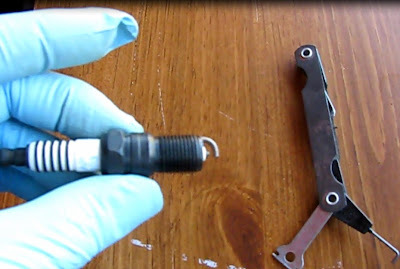 3) Remove the spark plug with about six or eight inches of extensions. 4) Installation will be aided by a helper such as a clawed pick up tool. Use a tool such as this to position the coil bolt through all the obstacles and into the hole. Finish turning it in by hand and with a wrench. On the 2nd plug from the back, the boot was badly stuck to the plug. No amount of twisting with a needle nose pliers would free it. Finally, it gave way but I found to my dismay that the wire part of the coil assembly pulled out, leaving the boot behind. Still the separated boot would not pull free. I sprayed a penitrent in there and let it sit a few hours. It finally came out. This is not a big problem as the boot can be twisted back over the wire terminal. Incidentally, the coil measures 1.4 ohms when good. Just make sure the penitrent is cleaned off all parts before reassembling. A spark plug is working as a lifeline for every vehicle. It helps to pass the current from an ignition system to the combustion chamber. Which helps to start the vehicle, therefore, we should take very good care of our vehicle's spark plug. From this article also, we learn some basic tips on how to take care of our spark plug system.